Kaizen is a Japanese word that simply translates to “improvement”, yet the philosophy of Kaizen refers to “small, simple, continuous improvements.” The company of Toyota is recognized as introducing Kaizen to Japanese Industry by encouraging their employees to everyday make small, even 1%, improvements to their effectiveness and efficiency. They found that by everyone making these small improvements every day, rather than making large dramatic changes periodically, the company ran smoother and profits and growth were more consistent and predictable. Once, Toyota demonstrated the success of implementing Kaizen, many Japanese corporations also began to incorporate this philosophy to find similar results. The Japanese Health Care System, likewise incorporated the principle of small, simple improvements with their patients and shortly after was considered the #1 provider of health care in the world by the World Health Organization. Decreased tension in the Nerves, Muscles and Joints and the indicators of this tension. Increased respiration throughout the spine. Increased sense of well-being and ease. Increased range of motion and improvement of posture in the spine. See how you can bring the principle of Kaizen into your life. What is one small (even 1%) improvement you can make to your life each and every day? If you any questions or would like support with this, please let us know! Categories: Chiropractic, Health and Wellness, Network Spinal Analysis, Wellness | Permalink. Have you ever intended to make a change only to find yourself right back where you started shortly thereafter? Perhaps you had a low back pain and your posture was off and you wanted to change your structure, so you visited a chiropractor? Perhaps you wanted to change a behavior such as quitting smoking or exercising and eating healthier, so you joined a gym? Perhaps you were feeling anxious or depressed and you wanted to change your perception so you consulted a therapist? Often when making changes such as these, we often find ourselves frustrated that it is so difficult to make the change. Have you ever experienced this? I know I have. Why is this? The answer can be found in a model called The Triad of Change. The Triad of Change illustrates that in order for there to be a change, three things must be congruent: Structure, Behavior and Perception. Structure = What we have – our body, home, business, schedule, relationships, finances, etc. For every Structure, there is a corresponding Behavior and Perception. For every Behavior, there is a corresponding Structure and Perception. For every Perception, there is a corresponding Structure and Behavior. In order to make change in one of these “sides of the triad,” the other 2 sides must be in congruence. Let’s say you have low back pain and your posture is off, so you visit a chiropractor to get help in changing your structure. In order for there to be a change in the structure, there will need to be a congruent change in your behavior and perception. The change in behavior may be more effective bending strategies and doing some stretching. The change in perception may be rather than looking at the pain as something wrong, looking at it as an alert signal from your body to do things differently. Let’s say you are feeling anxious and depressed and want to change your perception. In order for there to be a change in the perception, there needs to be a congruent change in your structure and behavior. Have you noticed that when feeling down, that your posture tends to be hunched over, head and neck forward and down? The change in structure may be to change your posture…hold your head up and bring the shoulders back…perhaps working with a NSA practitioner to help you with the change. The change in behavior may be to take deep breaths and get yourself active in something you enjoy such as painting or exercise. So you can see from these examples, that in order to make an effective change in any other sides of the triad, there must be a corresponding congruent change in the other two sides. So how do we effectively use the Triad of Change to make substantial, long-lasting change? Although counter-intuitive, the greatest hindrance to making effective change is that we focus on the area that needs to be change. For example, if we want to change a behavior such as a habit, we tend to focus on the habit and try to change our behavior. If we want to change how we feel (our perception), we tend to dwell on how we feel. If we want to change our structure, such as a our finances, we tend to focus on the finances. This is our greatest source of struggle. For generally, the side of the triad that we want to change is our weakest link and by trying to make a change utilizing our weakest side is a sure formula for further struggle. If you want to change Behavior (What you are doing) change what you are focused on and the structure in and around you congruent with the new behavior you want to create. If you want to change Perception (How you think and feel) change the structure in and around you and what you are doing congruent with the new perception you want to create. Have you every felt down or stressed out (Perception), so you went for a walk (Behavior) in a Park (Structure) and not only did you start to feel better (Perception) but you had a creative idea that would move you forward. (New source of energy in New triad). This is the model at work! 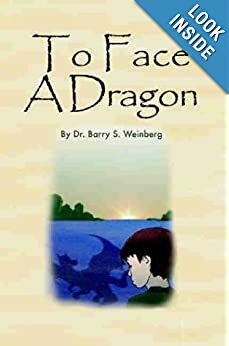 By focusing on the other 2 sides of the triad, the other side you wanted to change….changed, and the new congruence of the 3 sides allowed you to tap into creative resources that were unavailable before. Have you ever need to move a new apartment or house (Structure)? If you just focused on the new residence you wouldn’t move anywhere. By shifting your focus to the ideals you would like to experience in the new house and how it would feel (Perception), taking action to look at listings, visit homes and then make a choice and actually move (Behavior), before you know it you are in your new house. (Structure). You can also apply this example to finding a new job, relationship, etc. Have you ever wanted to start exercising or go on a diet (Behavior). Generally, when you failed, you probably were focused on losing weight and attempted it on your own. But those times you were successful, you focused on how the new you you wanted to feel (Perception) and joined a gym or exercise class … or followed some diet regime such as Weight Watcher’s or Atkin’s in the case of diet (Structure). What is something you want to change? 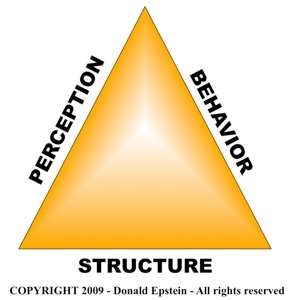 If it is a Structure, what is a compelling reason to make the change (Perception) and what can you do differently (behavior) that would be congruent with that new structure? If it is a Behavior, what is a compelling reason to make the change (Perception) and what can you change around you (structure) to support that new behavior? If it is a Perception, what can you change around you and do that would be in alignment with that new perception. At A Place for Healing, we support people in their health and wellness goals by implementing the Triad of Change. Network Spinal Analysis (NSA) uses gentle touches on the spine to help develop new internal emerging strategies of breath and movement (behavior) to optimize the posture (structure) of the spine and nervous system and be more effective at adapting to stress (behavior) helping people to feel better and have a more satisfying and fulfilling experience of life (Perception). By changing structure and behavior, we change perception. So next time you need to make a change, determine which side of the triad that change resides. LET IT GO and focus on the other 2 sides! 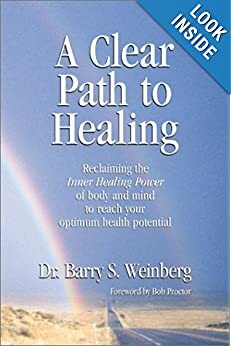 Categories: Uncategorized | Tags: adaptation, Awareness, behavior, change, chiropractic, decision, Network Chiropractic, Network Spinal Analysis, perception, Reorganizational Healing, structure, Triad of Change | Permalink. I am happy to announce some exciting changes at A Place for Healing. First of all, we have a new phone number! In order to better serve our clients and the community, the other exciting change is we are expanding our office hours. Please make a note of our new phone number and hours and we look forward to continuing to support your health and wellness goals with Network Spinal Analysis at A Place for Healing.